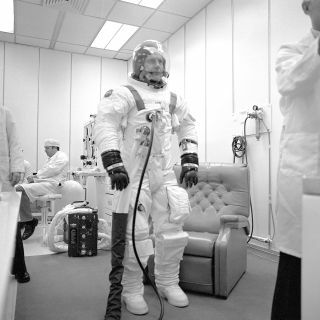 In this 1975 photo, NASA astronaut Deke Slayton suits up for an altitude test of the Apollo command module in an altitude chamber of KSC's Manned Spacecraft Operations Building (MSOB). The test was part of the Apollo Soyuz Test Project (ASTP) effort. Donald "Deke" K. Slayton was a B-25 pilot with the 340th Bombardment Group in WWII. He flew 56 combat missions in Europe and later flew seven missions over Japan. Slayton was named as one of the Mercury astronauts in April 1959. He was slated to pilot the Mercury-Atlas 7 mission but was relieved of this assignment due to a heart condition discovered. He was restored to full flight status and certified eligible for manned space flights in March 1972. Slayton made his first space flight as Apollo docking module pilot of the Apollo-Soyuz Test Project (ASTP) mission, July 15-24, 1975. This joint effort resulted in the first meeting in space between American astronauts and Soviet cosmonauts.